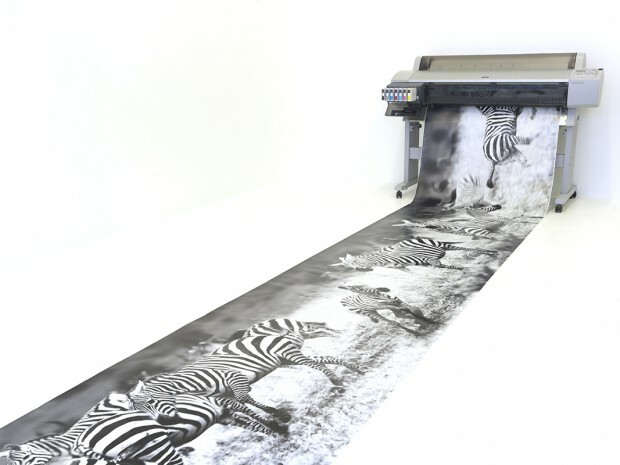 Our state-of-the-art large format Epson printer and Ilford RIP software, produce high quality, colour-accurate, archival pigment prints of artwork, whether it be a unique work or a multiple edition. We stock a wide variety of papers, from glossy photo paper right through to fine art canvases and Hahnemühle paper. We can print up to 44 inches in width and our record to date is 10 metres long! This is great for panoramic views or backdrops for exhibition stands. Our speciality is to colour match to your originals and we pride ourselves on quality. Our Ilford RIP software is set up to produce black and white as well as colour. Our previous experience of nearly a decade spent printing in the darkroom means we know how to get the maximum from your image to produce the finest quality print using our digital equipment.One off printing or editions in large quantities can be produced once you are satisfied with your proof, deadlines for exhibitions and last minute commissions or competitions will always be met. As a special service this year we are offering an authentic seal of approval by having a Steve Russell Studios stamp on your print. This gives buyers and dealers alike genuine proof of the printer and confirms our commitment to quality. If you need your prints immediately, we can offer same day printing. Even if you need your artwork reproducing before printing, come to the studio where we will photograph your artwork using our super high resolution Hasselblad, colour-matching to the original, then printing on our large format Epson on your choice on paper. Whilst printing you have the choice of having a look around our current exhibition showing Steve’s latest works from The East African Coastline.